Most of us at some point or another have filled up this boring forms with annoying Captchas. For those of you who dont know why we do this here is a short story. Suppose you own facebook ( you probably don't .. do you ?). And you have this annoying forms that every user needs to fill up. Account creation forms, login forms and what not. You better know it more than me. So, you probably don't want an automated script to automatically access the login page and go on creating accounts on your website till the point that it crashes. 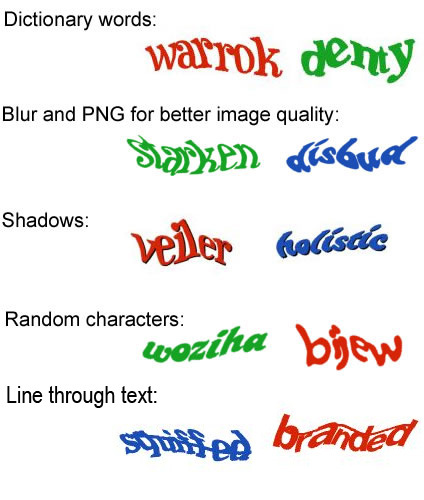 So, Captcha is a way to distinguish humans from these automated bots. The idea behind Captcha is to fill up a field from user, an answer to which only human intelligence can respond. So the user is presented with a distorted image of a word, letters or numbers and he is asked to fill up the same in adjacent field. The program knows the correct answer to be typed in beforehand and thus the fact that the entity accessing the website is a human. 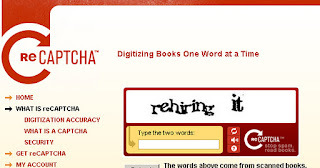 This part of the story is called - Digitizing books one word at a time. The story has another part, which has evolved recently. Just imagine, typing captcha's take about 10 seconds of you life and there are millions of users filling out captcha's everyday. A study shows that worldwide users spend (or waste ) around 5,00,000 hours everyday. Unless you are going to live forever and have plenty of time, this is a very annoying thing. 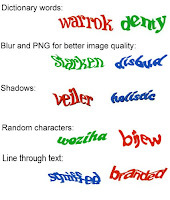 Then developers around world started thinking about more productive ways in which they can use captcha. Drawing some useful thing out of this apart from validating the fact that you are a human. Most of the books are torn away, faded and old. These books are scanned into images but currently there is no way to know what the words or phrases are actually in the book. 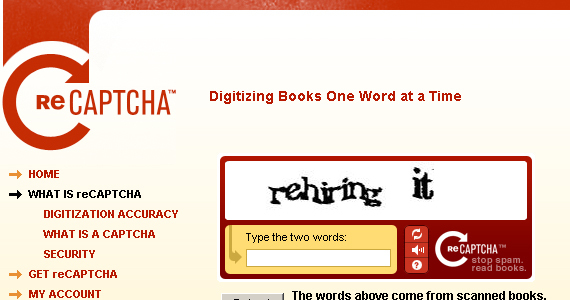 So now, every time you see a captcha image, the image is actually a word from a real book which you recognize in the process of validating yourself as human. So now you get two images as captchas. One for which the program already knows the answer and another images is actually the word the program wants you to recognize, the answer for which the program obviously doesn't know. Assuming that for every 10 users typing the first image as correct and second image as probably correct, at this rate we get around 100 million words per day! Note that the position of these images on the screen changes every time and you have no way of guessing which images is which one. Both the purposes of validating yourself as a human and contributing on a global scale to digitize books are achieved here. Whats more to this is , this all is free!! You don't pay to get your books digitized. Well Written! Useful Info. Never knew that we keep serving the online community unknowingly:) On a larger scale, it indicates how boring chores can be turned into useful real-time work!